Getting your point across is made all the more easy if you’ve got a big screen to display all your information. If you’re in any business it’s highly likely you’ve had to sit through or give a presentation of some kind. Huddling everybody round a laptop or giving out paper to display your information is hardly the most professional method. The best way to leave a lasting impression is to invest in a LCD projector that will allow you to make an image that takes over the room and really impresses. An LCD projector can be plugged in to many sources, such as a desktop PC, laptop or even a DVD player, but not all are created equally so make sure you get the right connections for your equipment before investing. Also be aware that some will be more suited to certain tasks. Many high-street shops sell projectors for the home, which are designed more for movies and TV so it’s best to stick to a specialist retailer who’ll be able to get you a projector more suited to PowerPoint and business use. Once you’ve got your projector and hooked all the cables up from your source you’ll need to set-up the display. Pick a large flat wall or, even better, invest in a screen that you can use. The lighter the colour of your surface the better the colour and quality of the images will be. 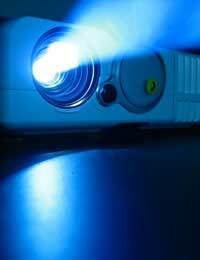 Many projectors have a zoom facility to make it easier to get the image size you want. The further back from the screen your projector is the larger the image will be, but be aware that the brightness of the image will reduce. You can counteract this by making sure that as much external light as possible is excluded. Make sure all blinds are closed and lights off and you’ll get a brighter image. Remember though that Projectors need to have plenty of breathing space and if your room is on the small size the temperature of the room will rise. So make sure there’s some ventilation to keep the heat down. You may also notice that the image isn’t exactly square so you’ll need to correct the distortion. This is called Keystone correction. It will let you flatten the image so it displays properly. Some projectors can do this automatically but, if not, it’s a simple operation that is usually done through the menus. Many projectors come with a built in speaker but as projectors get very hot they have internal fans that can drown out the audio. Therefore it’s a good idea to invest in some separate speakers if your presentations include music or sounds. The bigger the sounds the better the presentation.ProjectOnce you’ve plugged your projector is there’s not much more to do and they’re incredibly easy to use and maintain. Make sure you’ve got the right projector for your needs and you’ll be making large-scale presentations with real impact.